Nest bedding saw the need to match other online mattress in offering up to 101 nights of free trial. During this time, you can return your mattress for a full refund if for any reason you realize that it is not the best fit for you. The Alexander Signature Series Mattress is a revolutionary memory foam mattress, off the Nest Bedding stable. This is a company that believes no one mattress can fit the sleep needs of all sleepers. As such, they have created the Alexander mattress with various firmness levels, all geared towards accommodating as many types of sleepers as possible. It stands out as the most affordable alternative to other, pricier, name brand memory foam mattresses. Made of high-quality materials, the Alexander mattress has no chemical smell and features a superior design. Notably, the Alexander Signature Series has another version dubbed the Alexander Hybrid Signature Select Mattress. This version oozes comfort, thanks to its individually wrapped coils that offer an exquisite blend of support while at the same time offering just the right pressure relief courtesy of its copper-infused memory foam. To have a better understanding of the Alexander Signature series, it is only fair that we look at how this mattress is constructed. As we already mentioned, the Alexander mattress relies on its memory foam to attain a luxurious feel and this is the same reason its pressure relief abilities are exemplary. The Alexander Signature series features a blend of both cotton and polyester to make the cover. The upper part of the cover is pretty thin, and this makes it breathable, thus helping in temperature regulation. Notably, there is a distinctive 2-inch layer of foam, expertly quilted into the cover, give you almost a pillow-top effect, thus making it as plush as it gets. This makes the mattress’ initial feel comfortably soft. This is one of the measures taken by the manufacturer to give the mattress pressure relieving properties. At this point, we will not be fair if we do not mention that this mattress features three firmness levels; luxury, medium and soft. There is a distinct variety in each of these levels based on the materials used and overall construction. For the sake of this review thought, we will be focusing more on the medium firmness level. The comfort layer here is a 4-inch construction of gel memory foam. Research shows that gel memory foam helps to regulate pressure and this is made even better with the regular memory foam that is known to trap in too much heat. This eventually results in your sleeping much cooler as the gel infusion pulls the heat away from your body. Nest Bedding was articulate enough to place a thick layer of memory foam as close as possible to the sleeping surface as this ensures that you experience just the right pressure relieving properties of the soft material. This layer responds slowly to pressure and gives the mattress just the right body contouring. This layer forms an additional inch of memory foam that is also expected to help relieve pressure much further. With this layer in place, you will experience the sinking feeling a bit more, something that is synonymous with memory foam mattresses. This layer changes the feel of the mattress right from the memory foam on top. This 1-inch polyurethane foam layer is specifically made to help provide you with some initial support, even as you sink into the mattress. It basically works as a transitional layer from the soft memory foam just above it to the base layer below. As such, you do not notice a sudden change in feeling as you sink further into the mattress. This is 4 inches of high density polyfoam. Its main function is to provide basic foundation to the mattress, supporting not only the layers above it but also the sleeper. The base layer is basically the source of the mattress’ shape and structure and also helps give the much desired durability to the mattress. Firmness is what can make or break the viability of a mattress. As such, most manufactures are careful not to mess on this aspect. 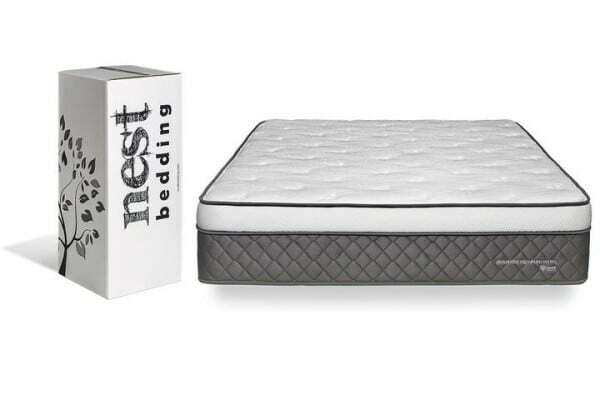 This is no different when it comes to Nest Bedding that has seen the need to offer variety in regards to firmness levels. Before we specifically focus on the Alexander Signature series, it is only fair that we look at the other firmness levels offered by the company. As already noted, the Alexander Signature series basically comes in two version; luxury firm and soft versions. The mattress’ soft version features 1.5 inches of quilted cover with 2 inches of gel memory foam under it for a comfort layer. This is then followed by 2-ich Visco foam that sits just above the 3-inch transition polyfoam layer. A 4 inch base layer of high density polyfoam then completes the construction. On the other hand, the Alexander Signature Luxury Firm consists of three total foam layers. Its base features a 6-inch high density polyfoam. With a simple press on the Alexander Signature Series, you would notice an initial feel courtesy of the soft quilted top cover. Once you push it through further, you will feel the gel memory foam under it and almost immediately, the contouring aspect of the mattress sets in at this point. The perfect combination of a thick memory form layer and a quilted cover is recipe for good pressure relief. This being the medium version of the mattress in terms of its firmness, it is expected to appeal to most sleepers. This is especially so for side sleepers whose hips and shoulders tend to sink in more. On the other hand, the stomach and back sleepers may prefer the firmer version that will help align their spine properly. With this mattress, you are assured of a perfect balance of both support and pressure relief and is therefore ideal for sleepers who do not have specific sleeping needs or the need to roll over at night in the name of changing positions. If you expect to share your bed with someone else, be it your partner, friend or frequent visitors, it will only make sense if you lay more emphasis on motion transfer properties of the mattress you buy. This way, you will get to know how it feels when they roll or get on and off the bed. In order to determine how best it performs on this front, we did several tests where we dropped a 10lb steel ball from heights of 12, 8 and 4 inches while measuring the amount of disturbance each of these causes on the far end of the mattress. These tests show that the mattress does pretty well in trapping in motion, thanks to the thick memory form layer on top. With a 4-inch drop that mimics someone rolling over or changing positions, there was little motion detectable on the other side. For the 12 inch drop that represents someone jumping into the bed, there is a considerable disturbance but luckily, it dies down quickly. If for any reason you will need to use the entire surface of the mattress, then it would be important that you consider its support at the edges. For Alexander Signature series, its edge support is pretty impressive for a memory. Having tested other mattresses before that had less then desirable results, we are glad that the Alexander Signature series does not disappoint. The mattress features a pretty form edge, thanks to the base layer that acts just like a box spring. In the morning when putting on your socks, you can comfortably sit on the edge without necessarily sinking in. The best thing about mattresses from Nest Bedding is that you get access to financing; this means that you can commit to making monthly payments rather than a one off payment. This is especially ideal for those working in a tight budget. The company’s joy is to see its customers happy, and this informs its decision to offer a lifetime warranty for its mattresses. This is a feat that can be achieved by few in the industry. It is also an indication of how confident the company is about its product in terms of durability. To top it all, the company offers free shipping within the United States and your mattress will arrive compressed in a box.